7 topics: trust, leadership, passion, epiphanies, impact, language and thinking, given some alternative perspectives to help improve creativity. A creative entrepreneur, Tom has led the early-stage development of many products, projects and organisations. 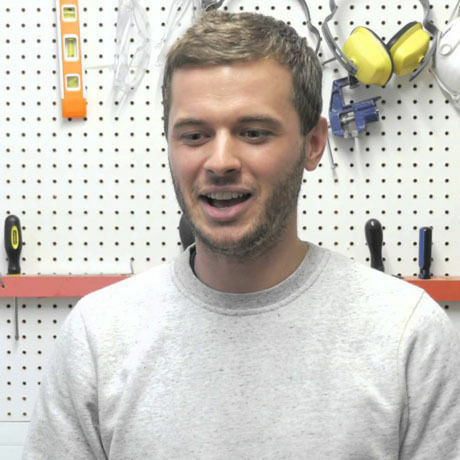 In 2013 Tom founded Makerversity link, now Europe’s most exciting community of creative startups with campuses at Somerset House, London and Amsterdam. Makerversity has been recognised by The Observer link as one of the Top 50 organisations in the UK ‘radically changing Britain for the better’, and by Network of Innovations, Culture and Creativity in Europe as the continent’s most socially innovative creative business. Tom is on the Mayor of London’s advisory board for workspace, is a TEDx speaker, an RSA Design Award winner and is a Trustee of Yorkshire Artspace link. His work has been exhibited at the Design Museum (http://designmuseum.org)[link], Barbican link and the V&A link, he has written for industry-leading publications and is a Guinness World Record holder. He was recently selected as one of the World’s top cultural innovators by the British Council link. Makerversity link: Makerversity is Europe’s most exciting community of emergent maker businesses. Our campuses at Somerset House, London and Marineterrein, Amsterdam provide work space, cutting-edge prototyping facilities, business support, funding and more to our 350+ members, as well as employability opportunities for hundreds of young people. Makerversity has three objectives: Supporting the best emerging maker businesses Inspiring the next generation of creative and practical minds Bringing making back into the heart of the city. Members also constitute the Makerveristy faculty, each contributing time and skills to inspire the next generation of creative and practical minds through work placements, events and their new education programme Makerversity DIY. Tom is also currently a senior lecturer in Visual Communications at Sheffield Institute of Arts link. Blimey! Between all of that, Tom is very generously spending a CreativeMornings with us, demystifying and discussing some mystery topics. So you better get yourself down to find out what they are. Trust us, with Tom you always learn something fascinating. Not forgetting the coffee from Dark Woods Coffee link being served from their Sheffield based star barista Tom Wilkinson link. All this, and the morning views across the city from Yoomee’s link new HQ at the iconic Park Hill link. We can’t wait. Don’t forget to register, set your alarm and we see you there!